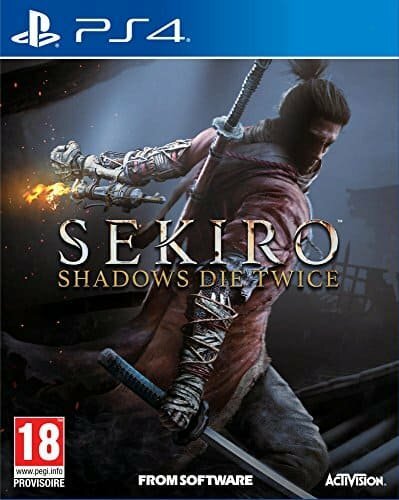 Like many of you, I’m a big fan of From Software’s “Souls” series, so when From Software announced Sekiro: Shadows Die Twice, I was pretty much in from the get-go…despite my reluctant admittance that I was feeling some pretty heavy series fatigue. I always want more Souls, but also I wanted something new. Sekiro: Shadows Die Twice at once feels instantly familiar and intuitive, but has enough fresh concepts and gameplay mechanics to feel like a new game. Especially when some of those mechanics—and settings—are reminiscent of another series FromSoft dipped its toes into: Tenchu. 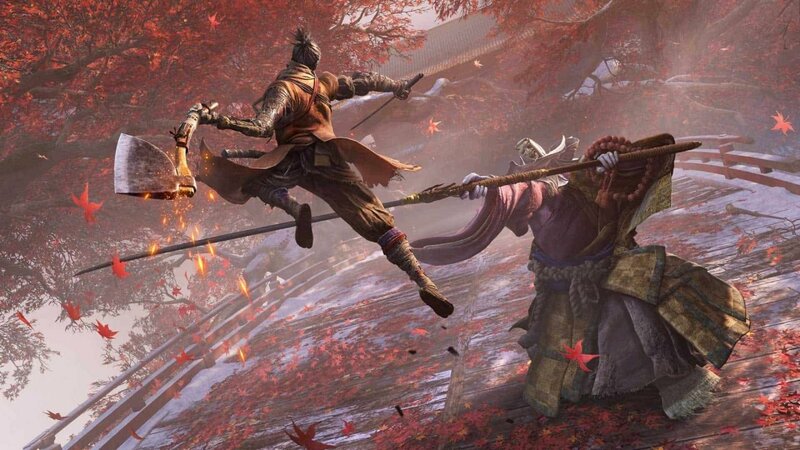 While there are certain aspects of the game I take issue with, Sekiro feels like the perfect lovechild of the Tenchu and Souls and that’s a pretty decent pedigree. As is tradition for my reviews of From Software games, I won’t be delving too deeply into the story. Half the fun of these games is jumping in blind and piecing the lore and plot together through item descriptions and cryptic conversations with NPCs. There is a curse haunting the land, you’re a Shinobi named Wolf and apparently the only one that can stop it, and it takes place in a pseudo-realistic mythical Japan. Also you get your arm chopped off and replaced with customizable and upgradable prosthetic with all sorts of nifty attachments, but more on that later. On that note, let’s talk what’s new and what returns in regards to the meat of the gameplay mechanics and how they compare to previous FromSoft games. First things first, there is no character customization, no allocating of currency (souls) to upgrade specific stats—so goodbye build variety—and no fashion potential. Everyone will play as the same character and progress more or less the same way. I’m not sure how I feel about this when it comes to the replayability factor, something FromSoft’s previous games are famous for. On top of this, there is no multiplayer aspect (yet, anyway) so you won’t have to worry about being invaded by gangs of red phantoms out for blood…but neither are you able to summon for help against particularly tough bosses. This is a streamlined, linear experience when compared to the Souls series, and this may not be exactly what long-time fans of expected, but with the bad comes the good—and more. Bonfires are still a thing, now in the form of shrines that allow fast travel between any checkpoint at any time. Resting at these shrines allows the player to spend experience and cash on items and skill upgrades and will reset the enemies in the area…as is tradition. The world is large and connected with plenty of optional routes and shortcuts to be opened. You will also die, a lot, with a darkening screen and oh so familiar red message that lets you know that you’ve died… so there’s always that old sense of companionship. What this basically means is that there are enough familiar elements that allow an almost instantly intuitive experience for anyone that has played the other games, but it comes with a whole set of juicy new mechanics to really give Sekiro its own identity. Verticality, stealth, and a lack of a stamina bar. These three things are, in my opinion, the biggest changes to a classic formula. 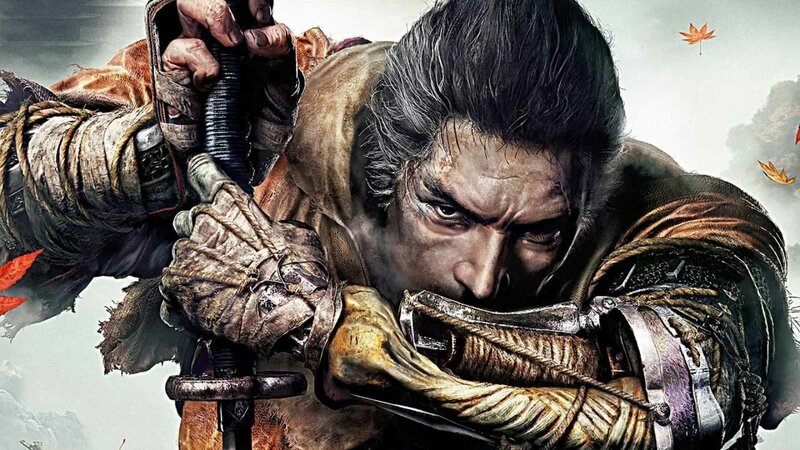 Early on in the game, players receive the Shinobi Prosthetic arm, the crux of combat and traversal in Sekiro. This instantly gives players a retractable grappling hook (just like in Tenchu) that really opens up the levels and adds some much needed depth and layering to a recipe that has been traditionally rather two dimensional in regards to traversal and combat. The addition of this expansion to the movement options for players cannot be understated, it adds a sorely needed interactivity with the environment that I’m actually shocked hasn’t been done before in the Souls games. Especially when combined with the second big change, stealth. The Wolf, our protagonist, is a Shinobi, which means sneaking around and killing enemies from the shadows. He can enter into stealth mode, which when combined with certain upgrades allows him to essentially move to and fro undetected, easily dispatching enemies that would prove far more challenging in a fair fight. This is hugely important because many mini-bosses are surrounded by goons, and facing them all head on while some giant ogre is swinging a scimitar at you makes things much more difficult. Getting that first undetected Deathblow in can make or break a difficult fight. It’s also simply fun to skulk around, throwing pottery shards as distractions and luring guards away from their posts and into dark rooms full of hidden katanas. And of course, if you get busted, most times you can use that handy grappling hook to shoot back onto a roof and wait for things to calm down. Things are beginning to come together. Finally, the actual combat itself is again, instantly familiar and fluid but innovative and markedly different the tried and true methods of block, dodge, parry, attack. 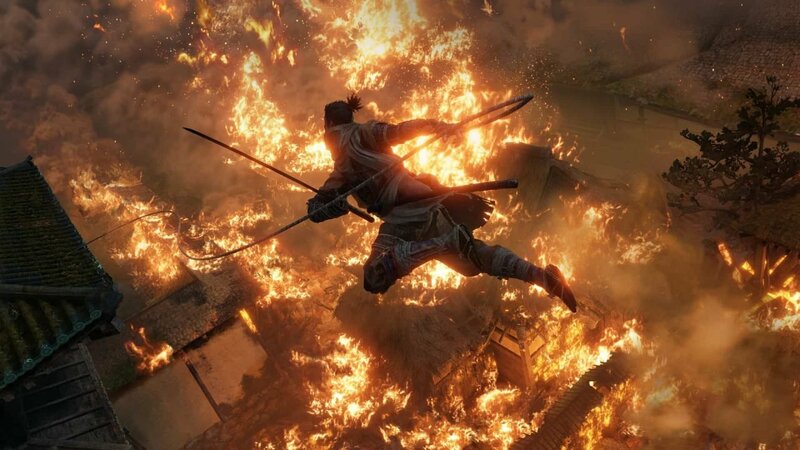 Combat in Sekiro is primarily focused on Posture and Vitality. Posture is essentially a blocking stamina meter, and when drained will open up the enemy for a Deathblow—which will kill low-level enemies instantly and take a health orb from a boss, they usually have two. If you choose to take a more agile approach, timing your parries perfectly to the enemy’s attack will also open them up for a Deathblow, making the fight go a lot faster. There are various combinations of attacking, dodging, and parrying, and the regenerating Posture bar doesn’t allow for a slow and tactical approach. This takes the Bloodborne approach of speeding up combat and encouraging aggression to the next level. You need to be on your toes during combat, and constantly juggling attacks and parries. If you wait too long to launch an attack or defend yourself, the fight goes back to the beginning in a sense. Its fluid, tight, and addictive, which is what we’ve come to expect from the developer, and feels at home for any Souls vet but provides a new and extremely challenging set of mechanics to master. Much to my dismay, there are no weapons to hunt down and upgrade in Sekiro. The Wolf gets his katana and his prosthetic arm and that’s it. No grinding for the final ingredient to take your Black Knight Greatsword to +10, combat remains exclusively the territory of the sword and magic arm. Fortunately, there is that aforementioned arm, which can be upgraded as the game goes on and fitted with various attachments from a fire launching cannon to a metal umbrella or poison blade. Not only are these tools useful in day-to-day combat encounters, but many of them can exploit specific weaknesses in the game’s bosses, making those fights a tad less one-sided. These tools can all be upgraded as well, increasing their power and range and offering new abilities and ways to use them. So, while there isn’t a huge range of weapons to choose from and specialize in, there is still a great deal of diversity available for tactical players to dive into and perfect with the prosthetic tools. The final and arguably biggest, new mechanic offered in Sekiro is the resurrection ability. When The Wolf dies in combat, he will be able to resurrect himself instantly at lower health and continue the battle. This can be extremely clutch in the final moments of a difficult boss fight, but it comes with a cost. The more often the Wolf uses this ability, residents of the land will become sick with Dragonrot. This can be curbed with certain rare items later in the game, but it will always return and increase with every death or resurrection. Keeping that balance is key to fighting the rot, but it can be very tempting to keep resurrecting after every frustrating death. There are certain things I expected from Sekiro that aren’t on offer, weapon and gear variety and build diversity primarily, and I feel that may harm the longevity of the game, more so when combined with the (so far) lack of multiplayer. Of course, it’s very early stages, and FromSoft games don’t reveal their true depth right away. Rather than focus on what’s lacking though, it’s important to focus on the tremendously addictive and fluid action game that is here on the surface, and to applaud FromSoftware from finally—albeit still sort of reluctantly on my part—breaking away from the Souls franchise and its multiple entries of required mechanics and tropes. It’s still a FromSoft game, and it feels like one, from the familiar fonts and dialogue to fast-travel options and epic boss fights, but it’s both fresh and familiar, and still as challenging and mysterious as its predecessors. 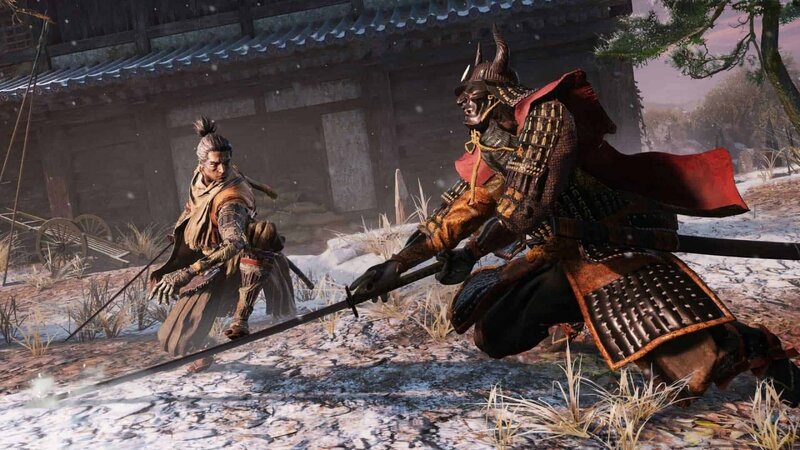 Sekiro brings a lot of new ideas to the table while maintaining enough comfortable staples to create an experience both fresh and familiar.